Vihan messU is the name of a very productive solo-project by a Finnish guy called Henri Raekallio. Last decade and this decade, Henri created a whole discography under different monikers, amongst which Vihan messU, which means something like ‘wrath from the masses’ or ‘fair hate’. Via the great Finnish label Patologian Laboratorio Productions, run by Aki Klemm, two Vihan messU recordings were presented to the thankful audience, being this one and an untitled one. The latter will be reviewed and published soon. 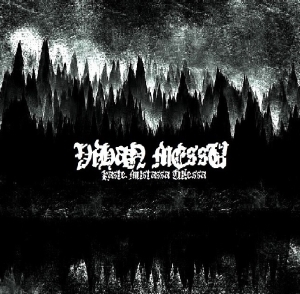 Out of the three main projects Henri runs (he’s also the guy behind great projects like KKMK and Awesome Depression – worth checking out), Vihan messU undoubtedly is the most straight-forward and Nordic-styled Black Metal oriented one. This is one of the purest forms of Second Wave-styled Melodic Black Metal, which gets translated through the sound as well. The production is quite raw and unpolished, lacking any modernistic progressed exaggeration in mix or recording. Because of the dense execution, that roughness does not bother, for all elements (instruments + vocals) are performed in a fine audible equilibrium. Music-wise, this album compiles a collection of melodious tracks with sort of an epic performance, coming with a very fine atmosphere, which reminds me of the more ritual-obscure bands from Finland, Norway, the U.S. or – well, it does not matter; it’s quite universal in its specific raison d’être. Yes, of course it means a lack of originality. But I spoke, sorry, wrote about Second Wave Nordic styled supremacy (no, I did not mention ‘supremacy’ yet, but it might give you a clue of where I am going to…), and originality is totally otiose, even harassing, for this specific approach. Okay, you do not need to be a brainless and cheap copycat, but just try to do your own thing. With Vihan messU, Henri does. The guitar melodies are like the spine of the songs’ structure, heavily supported by a massive rhythm section, and joined by some fabulous leads and quite grim, deep-growling blackened vocals (not of the high-pitched kind, nor death-grunting, yet rather occult, as in evocative…). It’s mid-tempo for the better part, with a couple of decelerated parts, as well as some faster outbursts – the latter strengthened by those artillery drum patterns. For the purists: the re-recorded material comes especially from albums like Hauta, Lihan Tie or Kaiken Elämän Raunioilla, so we’re talking about the era 2009-2011, ergo for a part it overlaps the material on Liittona Pimeyteesi, and partly it’s ‘younger’ too.